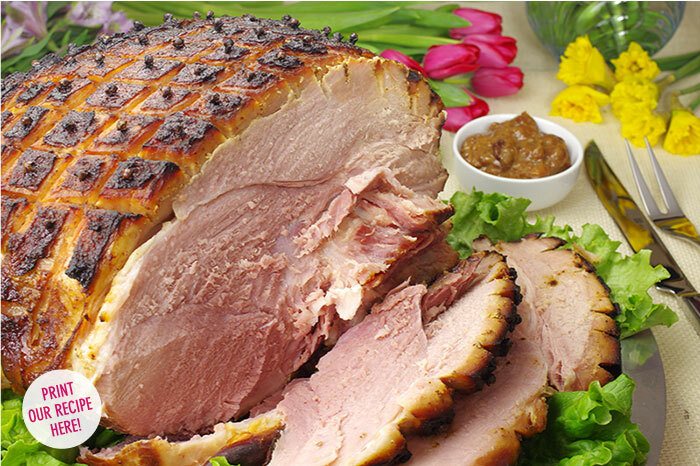 A classic this time of year, ham is a great anchor for our Springtime Dinner Menu. Relatively inexpensive, a ham is foolproof to make, and easily serves a crowd. Our twist on the classic ham is two-fold. First, choose a smoked ham that has had plenty of flavor already infused thanks to the smoking process. Secondly, treat the ham to a tangy, sweet, and spicy glaze that also becomes a delicious sauce. 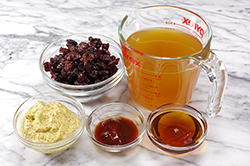 Our glaze/sauce features dried tart cherries, Dijon mustard, a little maple syrup, and a spicy kick thanks to the chopped chipotle in adobo sauce. You’ll love the flavor combination! 1. Make the glaze: In a small saucepan, place the dried cherries and chicken stock. Bring to a boil, remove from heat and allow to stand for 15 minutes or until the cherries are rehydrated and quite tender. 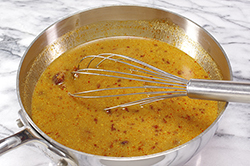 Whisk in the mustard, maple syrup, and chopped chipotle in adobo sauce. The glaze will be thin. 2. Prepare the ham for roasting by scoring the surface of the ham in a diamond-shaped grid pattern. The scoring should reach through the outer fatty layer, usually about 1/2-inch deep. If desired, place a whole clove in the center of each diamond. 3. Place the ham on a rack in a large roasting pan, scored side up. 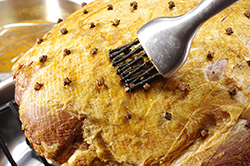 Fill the bottom of the roasting pan with water to about a 1/2-inch depth to preventing scorching of ham drippings. Lightly brush the surface of the ham with the liquid portion of the glaze (leave the cherries in the pan). 4. 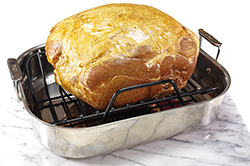 Roast the ham in a 350° oven until the internal temperature reaches 135°F at its thickest point, Allow approximately 12-15 minutes for each pound, (e.g., 3 hours for a 12 pound ham). Baste with the glaze every 30 minutes. After the initial 30 minutes, tent the ham loosely with aluminum foil. Remove the foil tent for the last 30 minutes to allow for final browning. Allow the ham to rest for 15 minutes prior to carving. 5. 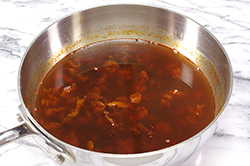 To make the sauce, bring the remaining glaze to a boil in a saucepan. Mix a slurry of cornstarch in cold water. Add to the boiling sauce and whisk continuously until thickened. Serve on the side as a condiment for the ham.